What do you do when you find yourself waiting for something to happen while having nothing to occupy yourself with? For one thing, you can always play a few battles in World of Tanks Blitz. But if you're looking for something a little more peaceful, the new World of Tanks Magazine has you covered! The World of Tanks Magazine is the newest official magazine released by Wargaming. Within these virtual pages, players from across the world will be getting up-to-the-date news, tips and tricks for World of Tanks. But that's not all! 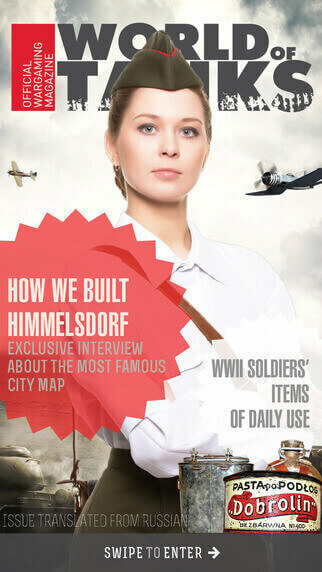 Also included in the magazine are articles about military hardware past and present, historical pieces about 20th Century warfare and interviews with the developers behind Wargaming's biggest gaming titles. Note: The magazine will be published in English. The magazine will be available for free on Google Play and the Apple App Store. Download yours now and stay connected with all the news!